I am coming to realise that I could not have chosen a worse time to start a food blog. I am trying to lose some of the weight gained after several months of cake and biscuit recipe development for work. So my focus outside work is exercise, sleep and more exercise. Not exactly inspiring for anyone to read about! Couple this with the hottest few days for a while and my inspiration is drying up fast. So I was grateful to my daughter last night for suggesting a simple post-gym supper of scrambled eggs, smoked salmon and wilted spinach. Even more delicious as it can be knocked together in ten minutes whilst sipping a tiny glass of chilled fino sherry. As i stirred the eggs and felt my body unwind from another stressful working day I thought about some of the recipes that I have been working on that haven't made the cut so far. Creating recipes is the most lovely part of my job, it is time to let loose my imagination and experiment with ingredients and ideas. Sadly though, the next part isn't such fun. Having created taste explosions, delicate crackers and iced fancies, I have to work out which, if any, can be made in our bakery and will stand the packaging, shipping and in-store handling that they will encounter to arrive on the shelves of supermarkets up and down the country. And that is before the final journey from shelf to home cupboard or fridge. We are keen to avoid over-packaging our foods so the idea of polypropolene frames to corset our creations inside cardboard boxes doesn't really fit for us. And we are so concious that such packaging often costs as much, if not more, than the ingredients themselves and really, that irks. The packaging is thrown away when the product is consumed, so surely we should focus our budget on the best ingredients, not more packaging? Of course, this does mean that we limit the type of products that we can sell on a wide scale. We have stopped doing farmers markets at present too so creativity is limited to robust products that taste great but can be handled without care. So that leaves us working with the concept of great tasting foods made with high quality ingredients, and isn't that just the way it should be? Wash the spinach and shred if required (supermarket bagged baby spinach will wilt whole but farm or home grown spinach should be shredded). Put the spinach in a pan with a dribble of water and a sprinkling of salt over a very low heat with a lid on. Crack the eggs into a bowl. 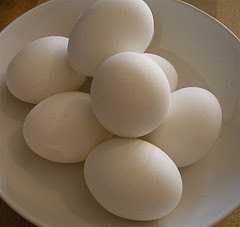 Using a half shell from a cracked egg, measure out a 1/2 shell of milk for every egg you use. Add a little pinch of salt per serving. Beat the eggs and milk together with a fork or whisk until you break down the stringy white (albumen). Grab a plate for each diner and artistically position the salmon on the plate. Quarter the lemon and put a piece on each plate. In a thick bottomed saucepan melt a knob of butter, then pour in the egg mixture and stir gently but constantly with a flat bottomed spatula sliding along the base of the pan to ensure the egg mixture doesn't solidify on the bottom. Check the spinach to make sure it is steaming, add a little water if it is too dry or drain off liquid if you can see lots of juice in the pan. Keep stirring the eggs & the mix will gradually thicken and become creamy. Take the eggs off the heat when they are still slightly runny. This means that it will not overcook whilst you serve the spinach. Drain the spinach and serve up followed by the soft scrambled eggs. Serve with the lemon squeezed over both salmon and spinach and a grinding of black pepper. Photo by kind permission of cursedthing of flickr.